PortaFab modular buildings are perfect for use as stadium press boxes. These weatherproof shelters provide shelter and an excellent vantage point for announcers, score keepers, videographers, and their equipment. All units come with pre-assembled lighting and electrical systems so that everything from speakers to video equipment can be powered from one central area. Optional shelves are perfect for creating a work area for coaches and announcers. These heavy-duty booths feature an all welded, all aluminum weatherproof construction that can be custom painted in school colors. 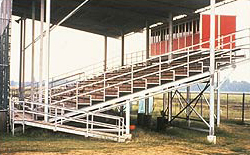 Booths with load-bearing walls can also be used to provide a working platform on top of the press box for video cameras or additional personnel.